I received much support from my family and friends. Throughout my journey they cheered me on as I challenged myself and tried unfamiliar technologies. I am forever thankful for their support and patience. I plan to continue my professional growth by attending seminars and workshops to further learn to educate the youth and to provide meaningful digital learning opportunities within the classroom setting. In addition I plan to share my new learning with others and surround myself with educators who are open to change, open to challenge and open to preparing our children to be successful 21st century citizens. Thank you Touro and SPHDS for your support. 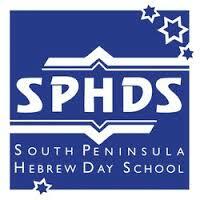 ​Thank you South Peninsula Hebrew Day School for contributing to my professional growth by way of introducing the program to the school and by financially contributing a thirty percent monetary stipend. I would like to thank the educators from Touro who devoted their time, patience and guidance as I embarked on this journey.